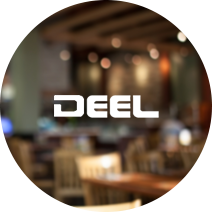 DEEL Media was founded in 2007 to solve a problem in the digital menu board space. Theaters, restaurants, stores, and amusement parks were frustrated. There were lots of digital menu board providers in the marketplace, but their solutions were failing. Bill and his business partner, Bryan Lynch, saw an opportunity, and decided to create CARBON™: a synchronized digital menu board system that would fulfill customers’ expectations and allow them to more easily create, implement, and manage digital menu content across multiple locations. Critical to DEEL Media’s success, however, was to identify a custom software development company to build the inner workings of the software. DEEL Media was specifically looking for a partner that would bring a high level of critical thinking and insight to the project, as well as the technical expertise to actually create the complex system and database required. Based on a recommendation from a business connection, DEEL Media identified and approached Kopis with their research and high-level functional requirements. Kopis developers in Greenville, SC quickly grasped the concept and tackled the project, creating the first version of CARBON™ in a matter of nine months.